The Miami Marlins head to AT&T Park on Friday, July 7, 2017 to take on the San Francisco Giants. The expected starting pitchers are Dan Straily for the Marlins and Matt Moore for the Giants. The odds for this matchup have Miami at -108 and San Francisco at -102. The Marlins have a 45-32-6 over/under mark and a 42-41-0 run line record. The Giants are 37-49-0 against the run line and have a 38-41-7 over/under record. The Marlins have a 38-45 overall record this season. Starting pitcher Dan Straily has a 6-4 record with an earned run average of 3.51 and a WHIP of 1.10. He has 94 strikeouts over his 95 innings pitched and he's given up 75 hits. He allows 7.1 hits per 9 innings and he has a FIP of 4. The bullpen has an earned run average of 4.07 and they have given up 300 base hits on the year. Teams are hitting .247 against the bullpen and they've struck out 305 hitters and walked 136 batters. As a team, Miami allows 8.6 hits per nine innings while striking out 8 batters per nine innings. They are 22nd in the league in team earned run average at 4.64. The Marlins pitchers collectively have given up 699 base hits and 379 earned runs. They have allowed 89 home runs this season, ranking them 28th in the league. Miami as a pitching staff has walked 322 batters and struck out 657. They have walked 3.9 men per 9 innings while striking out 8 per 9. They have a team WHIP of 1.39 and their FIP as a unit is 4.41. As a team Miami is hitting .266, good for 6th in the league. The Marlins hold a .421 team slugging percentage and an on-base percentage of .325, which is good for 16th in baseball. They rank 6th in MLB with 9.1 hits per game. Giancarlo Stanton is hitting .271 with an on-base percentage of .353. He has 84 hits this season in 310 at bats with 54 runs batted in. He has a slugging percentage of .545 and an OPS+ of 137. Marcell Ozuna is hitting .315 this year and he has an on-base percentage of .372. He has totaled 101 hits and he has driven in 64 men in 321 at bats. His OPS+ is 150 while his slugging percentage is at .576. The Marlins have 759 hits, including 129 doubles and 98 home runs. Miami has walked 223 times so far this season and they have struck out 645 times as a unit. They have left 560 men on base and have a team OPS of .746. They score 4.65 runs per contest and have scored a total of 386 runs this year. San Francisco has a 34-52 overall mark this year. With an earned run average of 5.78, Matt Moore has a 3-8 record and a 1.62 WHIP. He has 81 strikeouts over the 95 innings he's pitched. He's also given up 113 hits. He allows 10.7 hits per nine innings and his FIP stands at 4.75. The bullpen has an earned run average of 4.21 and they have given up 258 base hits on the year. Teams are hitting .255 against the Giants bullpen. Their relievers have struck out 242 batters and walked 113 opposing hitters. As a team, San Francisco allows 9.7 hits per nine innings while striking out 7.7 batters per nine innings. They are 20th in the league in team earned run average at 4.61. The Giants pitchers as a team have surrendered 833 base knocks and 398 earned runs this season. They have given up 94 home runs this year, which ranks 26th in Major League Baseball. San Francisco as a staff has walked 257 hitters and struck out 663 batters. They give up a walk 3 times per 9 innings while they strike out 7.7 per 9. Their team WHIP is 1.40 while their FIP as a staff is 4.11. As a team, they are batting .244, good for 24th in the league. The Giants hold a .374 team slugging percentage and an on-base percentage of .305, which is good for 28th in baseball. They rank 22nd in MLB with 8.4 hits per contest. Buster Posey comes into this matchup batting .331 with an OBP of .413. He has 87 hits this year along with 35 RBI in 263 AB's. He maintains a slugging percentage of .510 with an OPS+ of 146. Eduardo Nunez is hitting .299 this season and he has an OBP of .323. He has collected 76 hits in 254 at bats while driving in 25 runs. He has an OPS+ of 96 and a slugging percentage of .413. The Giants as a unit have 723 base hits, including 139 doubles and 72 homers. San Francisco has walked 251 times this year and they have struck out on 631 occasions. They have had 588 men left on base and have an OPS of .679. They have scored 3.94 runs per game and totaled 339 runs this season. 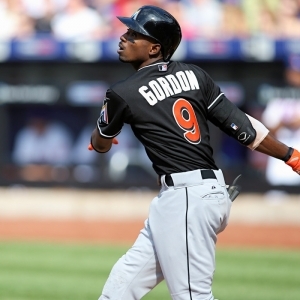 Who will win tonight's Marlins/Giants MLB game against the spread?